Today is Opioid Painkiller Addiction Awareness Day (OPAAD) – the first OPAAD was in 2015. The campaign aims to raise awareness about issues related to opioid painkiller dependence (OPD) – an addiction issue that can be an unintended consequence for some people taking opioid analgesics to relieve pain. 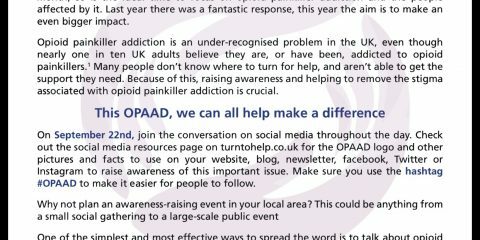 OPAAD aims to start a dialogue with and reassure people who are addicted to opioid painkillers that they have nothing to hide. Help and support are available for both patients and families affected by OPD. We want to highlight the need for improved awareness amongst the general public of the risk of becoming dependent on commonly available painkillers that contain potentially addictive opioids. We want to highlight NICE guidelines that recommend over-the-counter opioids should be taken for no more than three days. Ultimately we want to empower and help people to find the support they or their loved ones need to tackle their addiction. 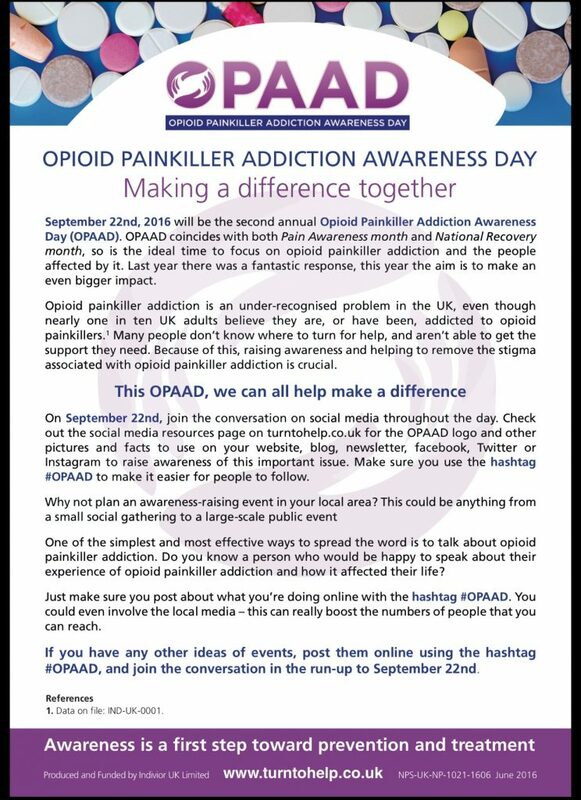 Opioid Painkiller Addiction Awareness Day Poster for opaad-flyer-2 here.